Due in large part to the macroeconomic environment, the stock is trading at historic lows compared to its earnings. But we can see from the chart that sentiment does vary dramatically when it comes to this stock. The changes in market sentiment that lead to the peaks and troughs of HD's P/E are quite dramatic! Nevertheless, despite the downturn, HD is quite profitable, and not in any danger of defaulting on its loan obligations (as discussed here). 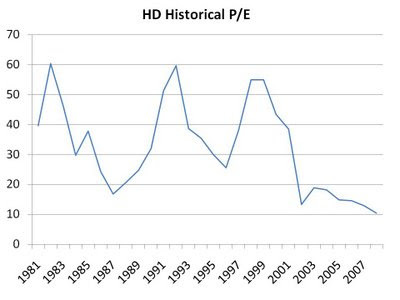 As such, HD may prove to be a value purchase for investors with long-term horizons.